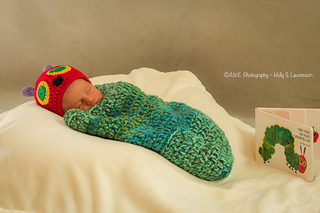 This newborn photography prop is one of the easiest you’ll ever make! I was able to combine two different self striping yarns for the illusion of color changes, SO you don’t have any color changes to make yourself! Yay for easy! I forgot to record the gauge, but I usually stitch pretty tightly. If you find this is working up to be way too wide, maybe go down a hook size. The finished cocoon should be approximately 9-10 inches wide, and 17 inches long. All text and images are owned by Erin Greene of ekayg, copyright ©2017. Images may not be used by anyone else without express written permission. If used, the ekayg watermark must be visible. Pattern LINK may be shared, but may NOT be copied and passed off as anyone else’s work. Please credit pattern back to ekayg. Finished products made from this pattern may be used for sale.